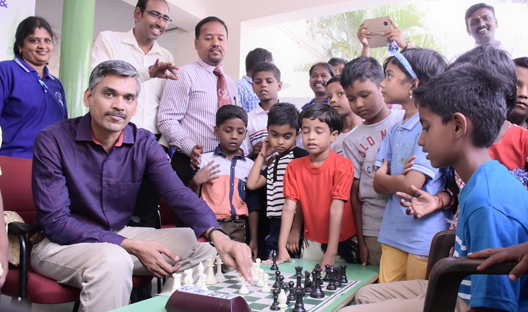 31st TN State U-7 Open and Girls Chess Championship 2018 was organised by the Chennai District Chess Association from 06-05-2018 to 09-05-2018 at AVM Mat. Hr. Sec. School, Chennai. Grand Master R.B. Ramesh inaugurated the event in the presence of Mr. Muthukumar, Joint Secretary, TNSCA, Mr. Murugavel, Vice President, TNSCA, Mr. Sakthi Prabhakar, Joint Secretary, Chennai DCA Mr. Ganesan, Secretary, CDCA. 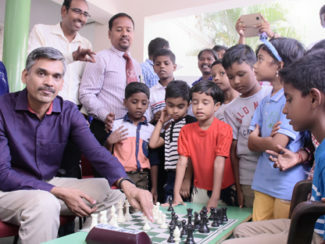 126 Boys players and 89 Girls players from 26 districts from Tamil Nadu took part in this event. 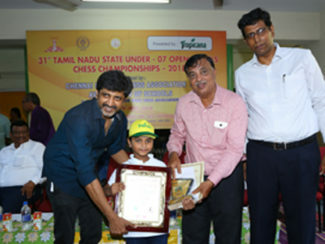 In the final round in U-7 Boys section Adharsh K from Chennai defeated AditKiruba Raj M from Madurai and became TN State U-7(Open) Champion. In U-7 Girls section Lakshana Subramanian from Sivagangai defeated Shwetha VS from Kanchipuram and became TN State U-7(Girls) Champion. Prizes were distributed by Mr. Mohan Raja,Film Director in the Presence of Mr.D.V. 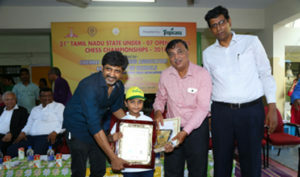 Sundar, Vice President, FIDE, Mr. Stephen Balasamy, General Secretary, TNSCA, Mr. AVM. K.Shanmugam, General Secretary, AVM Rajeswary Educational Trust, Balasubramanian V, VP, Corporate Communication, The Indian Cements Ltd., Mr. Ravishankar, Tresurer, Lions Club of Nungambakkam, Mr. Murugavel, Vice President, TNSCA and Balachandra Datta, VP corporate Affairs, Hyundai Motors.